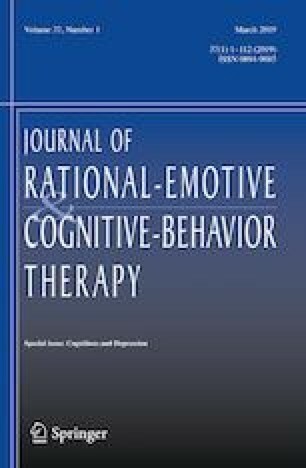 This study determined the effect of a cognitive behavioral group therapy (CBGT) program administered to infertile women on infertility-related stress, depressive and anxious thoughts, and general health state. A randomized controlled design was used for this study. The study was conducted with 107 infertile women: 55 in the experimental group and 52 in the control group. The CBGT was administered to the experimental group for 11 weeks. The pretest, posttest, and trimester follow-up results of this group were compared with those of the control group. The experimental group’s Fertility Problem Inventory pretest mean score was 188.47 ± 30.699, posttest mean score was 135.84 ± 22.571, and follow-up mean score was 140.61 ± 20.16. A statistically significant difference was found between the experimental and control groups’ pretest, posttest, and follow-up mean scores on depressive and anxious cognitions (CCL), FPI and its subscales, and the General Health Questionnaire-28 and its subscales (p < 0.05). The CBGT intervention reduced the infertility-related psychosocial problems experienced by infertile women and promoted improvement in their depressive and anxious cognitions, and their mental health. The authors would like to thank to all participants in this study. They also thank the nurses and secretaries in the infertility outpatient clinic for their support. Study design: AK, AY, SB; data collection: AÇ, AK, AY; article drafting: AK, SB, AY and data interpretation and revision and final approval of the article: all authors. Yorulmaz, E. G., & Sütcü, S. T. (2016). Effectiveness of cognitive behavioral group therapy in infertility: A systematic review. Current Approaches in Psychiatry. 8:144–156. http://dx.doi.org/10.18863/pgy.24953.